Cinnamon, sugar, milk, and eggs are mixed with oatmeal to create this hearty breakfast casserole. Lightly butter a 1-1/2-quart casserole; set aside. For oatmeal, in a medium saucepan, bring water and 1/8 teaspoon salt to boiling. Slowly stir in oats. Return to boiling; reduce heat. Simmer, uncovered, for 2 to 3 minutes for quick-cooking rolled oats or 5 to 7 minutes for regular rolled oats or until most of the water is absorbed and the oats are tender, stirring occasionally. Set aside. In a small bowl, whisk milk and eggs until well combined; set aside. In another small bowl, stir together brown sugar, baking powder, cinnamon and 1/4 teaspoon salt. 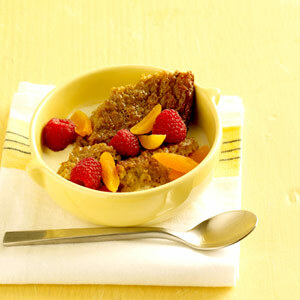 Stir brown sugar mixture into oatmeal. Fold egg mixture into oatmeal mixture. Pour oatmeal mixture into prepared casserole. Bake, uncovered, in a 350 degree F oven for 30 to 40 minutes or until center is just set and a cinnamon-sugar crust forms on top. Cool about 30 minutes. Serve warm with additional milk or half-and-half, if you like. Makes 4 to 6 servings. Fruited Baked Oatmeal: Prepare as directed above, except stir 2/3 to 3/4 cup raisins or golden raisins, snipped pitted dates or dried cranberries into brown sugar mixture. Continue as directed.